The music industry has a vested interest in promoting “so-called” hi-res music. Hardware manufacturers want you to believe that increasing the sampling rate to 192 – 384 kHz and lengthening word lengths to 32-bits will transform your listening experience — and make you invest in yet another upgraded DAC. Download and streaming sites want you to pay premium prices for standard-resolution music albums transferred to high-res bit buckets. In reality, the fidelity stays the same as the original standard-res source. And in spite these sites’ insistence that they “verify” the authenticity of each and every track through rigorous evaluation and that every track offered on their site is “high-res”, the fact is they aren’t (I’ll be writing an entire post about this false “feel good” propaganda soon after I had a back and forth with a download site founder about this issue.). We all want to believe that ever greater levels of fidelity can be derived from older — and cherished —— recorded tracks when they are advertised as “high-resolution”. But generally speaking, these new HD transfers don’t have better fidelity than the original versions from 30-50 years ago when they were released as vinyl LPs. Very few albums are “remastered” when they undergo digitization for the new download/streaming sites. Remastering can be an expensive process and the labels won’t spend the money, take the time to locate the original masters (they use whatever they can find), get artist approvals etc. It’s simpler to simply digitize the “best available” master . (sometimes a third generation safety copy) into a 192 kHz/24-bit PCM file or through the MQA lossy codec, normalize it, and send it off to the distribution channels. You think you’re getting the best version of a particular album but more than likely, you’re going to get the best “available” version — and you’re going to pay more to get it. The amount of misinformation is overwhelming. During the Munich High-End Show, I happened into a room with a large video screen promoting the virtues of “high-resolution” music. The Onkyo Music site has been providing audiophiles with “Hi-Res Audio” downloads for over ten years. I remember talking to them about my own catalog before I launched iTrax.com in the fall of 2007. I decided to build my own site because they refused to distinguish between “hi-res transfers” and actual new hi-res audio albums. All these years later they are still selling standard-res recordings as “hi-res audio”. They prominently — and incorrectly — display the “hi-res audio” logo next to the album covers. BTW The logo as administered by the JAS (Japan Audio Society) is limited to hardware and has no place on a digital music download site! — But that doesn’t stop them from using it). I took pictures of the video display at the Munich show. 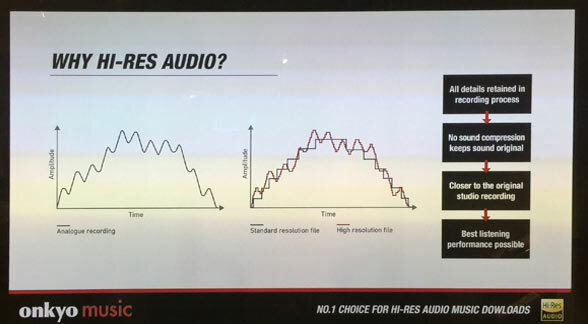 I’ll post them in a future post but first let’s take a look their “Why Hi-Res Audio?” chart of high-res advantages. On the left is a traditional time vs. amplitude graph showing the smooth undulations of an “imaginary audio waveform”. BTW I find it curious that the waveform is not periodic as you would find in a real audio file. I suspect the people in the marketing area of Onkyo have no idea how audio actually works. The right hand side presents the “digitized” version of the analog original in “standard resolution” and “high resolution. The coarse “stair steps” of the standard resolution version is compared to the much finer steps of the high-resolution version. The notion that a smoother graphic that “looks more analog” is wrong-headed and misleading. All that matters is whether the output signal is exactly the same as the input signal. Remember that the digital representation is really only a data set and has nothing to do with the graphic representation. The conversion back to analog adheres to the Shannon-Nyquist Theorem plain and simple. There are no stair steps in PCM digital files — the discrete amplitude values at each sample time are points in time NOT stair steps or levels. This oft repeated — and thoroughly wrong — visual representation tries to convince viewers into believing that the high-res version is “closer to the original studio recording” and that “all details retained in recording process”. In reality, if the sample rate and word length of the standard-resolution file exceeds the fidelity parameters of the analog original (think Shannon/Nyquist), then the standard and high resolution versions would sound identical. The analog signal reconstructed from both the coarse and fine digitized versions would produce identical analog output. The only time a benefit is achieved from a high-resolution recording is when the original recording was made using high-resolution equipment. Don’t forget that I will be at the Marriot Irvine Spectrum Hotel from Friday through Sunday exhibiting at T.H.E. Show. I will be set up at booth A2 selling discs and the “Music and Audio: A Guide to Better Sound“. Please stop by if you’re headed to the show. great post. really seems time for the FCC or FTC to attempt to apply some truth in advertising laws to the claims of the high res crowd. should be an empirical test and provenance proof in order to post a label on a product or service calling itself hi-res, etc. The government won’t do anything to stop this nonsense. If they don’t care about SR selling a $20,000 power cord, they aren’t going to talk about this stuff. It’s up to us to challenge the companies doing this. How do you think that this came to be the case? I can recall when the FTC mandated how power amplifier specification were stated. In the past there was regulatory oversight to prevent claims of 1 MW peak output power from an amplifier connected to a 115 VAC 15 A wall socket. The music industry — both hardware and content companies — are always looking for the next big thing. Moving to “hi-res music” was a clever marketing scheme cooked up to resell the same music all over again. MQA is simply the latest iteration of this thinking. There is considerable debate between casual audio enthusiasts, audio experts, and professional audio engineers about the definition of high-resolution audio. I spoke to one vinyl advocate who claimed his records produced “infinite” resolution. Mark you are right about so called remastered to Hires music files. I bought recently Bob Marley & The Wailers 24/96 Kaya from HD Tracks. Well what do you know, it wasn’t anywhere as good soundwise as my ripped Remastered CD. Very easily heard comparison. I did complain to HD tracks and they sent me an explanation and a refund. They claim they only resell what they are sent from Record companies. In saying this they do not give refunds readily but in my case possibly because I have bought quite a number of Hires downloads. I think they need to be told and in turn they can hassle the record companies otherwise this will never stop. We all need to lobby to get the bar raised for Hires music files. Concluding, most certainly new music recorded in 24/96 or higher is the best. I have downloaded 24/384 audio files by Carmen Gomes from a Dutch company owned by musicians. I havn’t been able to compare with a lesser bit rate but boy it sounds excellent. This company is producing some very nice Hires releases. Thanks Robert and I’m glad that HDTracks stood behind their service…however, most sites buyer beware. You purchase the tracks and you’re stuck if you don’t find it better. What I find most troubling is the insistence on calling everything an “HD track” or “high-resolution”. As I said, most tracks on these sites are not even remastered just transferred. The record companies are loving “hi-res audio” because they’re reaping huge new licensing fees from the likes of HDtracks, HighResMusic, SuperHighRez etc. RBCD offers 64,000 loudness levels over a 96 db range and can switch between any two of them in 1/44,100 second. The amplitude resolution is far smaller than the smallest audible increment and the switching rate is 10% faster than the fastest (highest frequency) a human being can hear. What more do you want? What more do you need? Is the curve smooth? You bet it is. Here’s a demo. I want the potential dynamic range to exceed 91 (CD when dithered is applied) and the ultrasonic frequencies that are present in the room as played by the instruments to be captured — that’s the meaning of fidelity. It doesn’t matter whether a human can hear beyond 20 kHz, there are very real benefits to moving well beyond 44.1 kHz sampling rates. I agree that CDs can sound absolutely fantastic AND beat vinyl/analog tape, but the move to real high-resolution certainly doesn’t diminish fidelity. I feel the HD download sites have been somewhat dishonest when they really didn’t need to be. If they had said simply we are selling you a HD transfer of your favourite ‘old’ analogue recording so that it will capture everything from that original recording and put it into the digital realm for you then great – I’m very happy with that. I have several 96/24 transfers of old Gary Numan albums done by the late John Dent of Loud mastering (main purpose being for re-issue on vinyl! ), no remastering or messing just straight transfers from the original record cutting masters and they sound great – without doubt better than the same albums remastered by John back in 1999 for CD release. I couldn’t agree more. Getting the best high-resolution transfer of the best analog original is the very best that we can hope for. Using 96 kHz/24-bits PCM is sufficient to capture 100% of the original signal — including all ultrasonic content. It also puts pre-ringing out to 48 kHz where it won’t matter and avoids “time smear”. The fidelity of an original recording at this specification has the potential to be better but doesn’t happen very often. As you say – sadly it isn’t often the best original source being used for the transfer but if it can be i for one really appreciate being able to play an old favourite album owned years ago on vinyl in a new format that is genuinely of slightly better fidelity and as close to the original tape as you can get without owning it. It’s provenance that’s the problem with all this stuff, in the case of those Numan transfers Loud Mastering were very clear about this, infact they even did a great little Youtube video of the most recent transfer of the ‘Dance’ LP showing the tapes arriving and being set up for the A/D conversion. It would seem to me that a direct cd transfer from a tape mastered for vinyl would be compressed. As I recall, the vinyl format could not carry the lower bass frequencies and they were “trimmed”. Not sure if vinyl can handle the high frequencies either. I prefer a remaster made specifically for the cd format. Patrick, the word compressed would apply to a transfer that doesn’t contain low or high frequencies. It is true that analog tape can extend past 20o kHz and vinyl LPs claim to have ultrasonics but the RIAA curve is not defined above 20 kHz and therefore vinyl LPs are not high-resolution. Which is why a 96/24 transfer done correctly in my opinion sounds better than the older CD level transfers done in the first instance. ADC have evolved since the early days of CD when recordings were being put out. It’s not HD though – simply a better capture from those tapes. Most people argue (fiercely) that you cannot improve on the original red book CD quality since no more information is available on the CD beyond that already captured at 16/44.1. Thus, sound quality cannot improve. Does anyone know what occupies the vast storage s[ace between the 16/44.1 and 24/96 files. I guarantee that these files sound different, not getting into which sounds better, but why?? The files do get bigger but the fidelity and sound remain the same unless there was unusual processing or a particular “dither” applied during the downconversion. The vast space doesn’t contain anything…just empty data. It’s possible for them to sound different buy that would be a problem of the downconversion process. If you capture both through identical ADCs from the analog source but with difference clocks, they would sound virtually identical. Whao, I’ve never read some much des-information in a single post!! This just sounds like a resentful little old kid which its music has not been given the attention it wants. 1. Is a know issue that Labels are the ones distributing sometimes the wrong files, or upsampled. Hopefully the labels which change and right their wrongs. 2. Digital files of old recordings come from an analogue recording!! For gods sake from where did you think they came? 4. The whole point of digital High Resolution Audio is to give the listener more headroom (24bit) over CD (16bit). If you do not know what that entitles then you should not be writing about this matter at all. 5. If you really think a CD (44.1kHz/16bit) version VS a 192kHz/24bit version of an original analogue recorded track sounds the same, let me tell you either have old age hearing loss or you simply are not using the appropriate hardware chain to listen to the Hi-Res file format. 6. I invite you to take a look at the wave form of any good DAW (Protools, Logic). 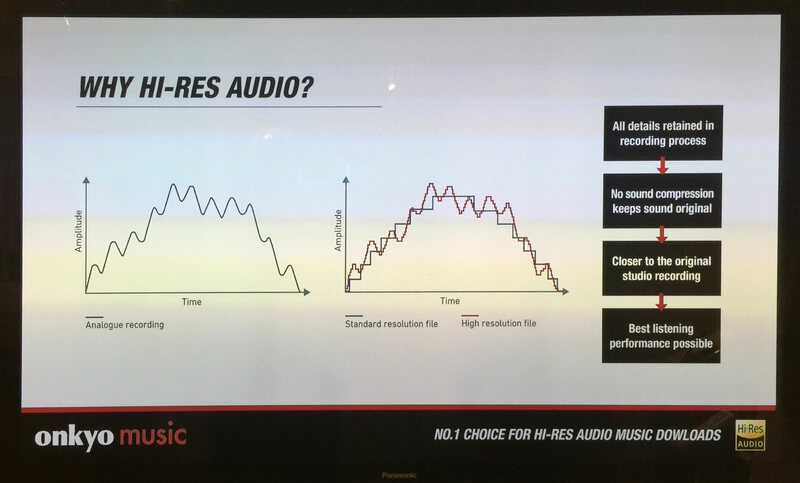 It is obvious the image you show from that download site (which I have not purchased music from I must admit) is a way to simplify to the regular user how the original analogue signal is digitised with contrasting resolutions, therefore it looks like you just want to complain for the sake of complaining without giving it much thought. Benito, I’m not really sure your comments make sense to me. If you have a contrary view, that’s fine. But the information presented in the post is accurate and true. There are a lot scammers in the highres arena, no doubt. But I have downloaded some files from 2L.no in 24bit / 352.8khz (which was used recording the music – the format is called DXD and SACDs are mastered in DXD) and listened to it on my Metrum Amethyst non-oversampling DAC. It sounds so realistic, it is almost boring. No digital noise irritations, just like opening the window and being there. In my experience, 24/96 sounds ok – just like a good MM turntable. 24/192 like a turntable with MC and 24/352 is like being in the recording room. YMMV. Btw. my Metrum DAC makes Red Book CDs sound better too. And no – I do not trust HDTRACKS. Usually I like to ripped LPs in 24/96 or 192 if available. Do not forget, that you do not know, how your “highres upsampling” Sigma-Delta DAC is working internally. It might be limited to processing the most significant 12bit, no matter the resolution. Have you taken the HD Audio Challenge…you might find it interesting and very telling. 96/24 is much more than just “OK”. I love Morten’s recordings but find them too distant and hollow sounding for my tastes. Using bi or tri amping is a step up for amplifier and speaker optimization. I wanted to ask you, Mr. Mark, if during the masters you grow and drop the level on certain instruments because I understand from the auditions. Finally, they also have my tweets working with these files, you just spoil your senses, and I think these files are good and to burn cables or dacs very quickly, do not you think? Mr. Mark, do you have in mind to pay attention to the DSD format in the future? I have written extensively on DSD and do not find it compelling at all.